The man who invented the Commitments back in the eighties is now forty-seven, with a loving wife, four kids ... and bowel cancer. He isn't dying, he thinks, but he might be. Jimmy still loves his music, and he still loves to hustle - his new thing is finding old bands and then finding the people who loved them enough to pay money for their resurrected singles and albums. On his path through Dublin he meets two of the Commitments - Outspan, whose own illness is probably terminal, and Imelda Quirk, still as gorgeous as ever. He is reunited with his long-lost brother and learns to play the trumpet. This warm, funny novel is about friendship and family, about facing death and opting for life. 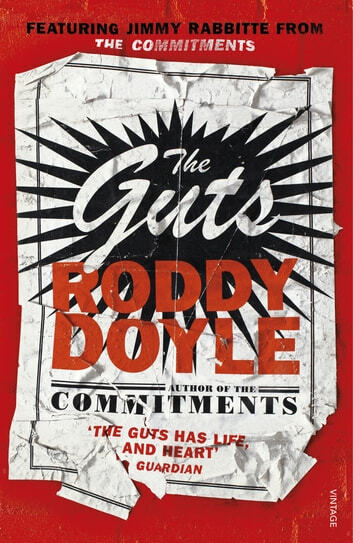 It climaxes in one of the great passages in Roddy Doyle's fiction: four middle-aged men at Ireland's hottest rock festival watching Jimmy's son Marvin's band Moanin' At Midnight pretending to be Bulgarian and playing a song called 'I'm Going to Hell' that apparently hasn't been heard since 1932. Why? You'll have to read The Guts to find out. This is classic Doyle. Profane, heart-wrenching and hilarious. Touching and honest, funny and sad. Jimmy is the sort of literary hero you want to follow from book to book. 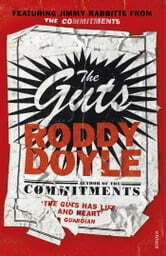 Roddy Doyle never disappoints.